Erris Inshore Fishermen's Association (EIFA) gets a dose of the crabs from Shell and were left scratching on Monday last! : Three years too late, EIFA 'fishermen', whose shillings from Shell have run out were back again on Monday on another begging spree. During this begging exercise by EIFA Shell's begging bowl ended up in the depths of the ocean off Ballyglass Pier and deep sea divers were successful in locating the bowl at co-ordinates 54-15-21 N, 09-53-49 W.
WHEN THE Volvo Ocean race sets a course for the Irish west coast this weekend on its final leg from Lorient in Brittany, a good southwesterly could have it taking advantage of the Atlantic’s fetch. Waves that have travelled thousands of miles could sweep the fleet on a broad reach past the Aran islands and into the shelter of the bay. An Oireachtas committee on the exploration sector off Ireland's coast has recommended a big increase on the tax take for exploration companies who strike oil and gas off Ireland. It suggests a tax take of between 40% and 80% to maximise the benefit to Ireland from oil and natural gas resources. Ireland currently applies a rate of 25% before capital writes offs. There are 11 recommendations in the report. 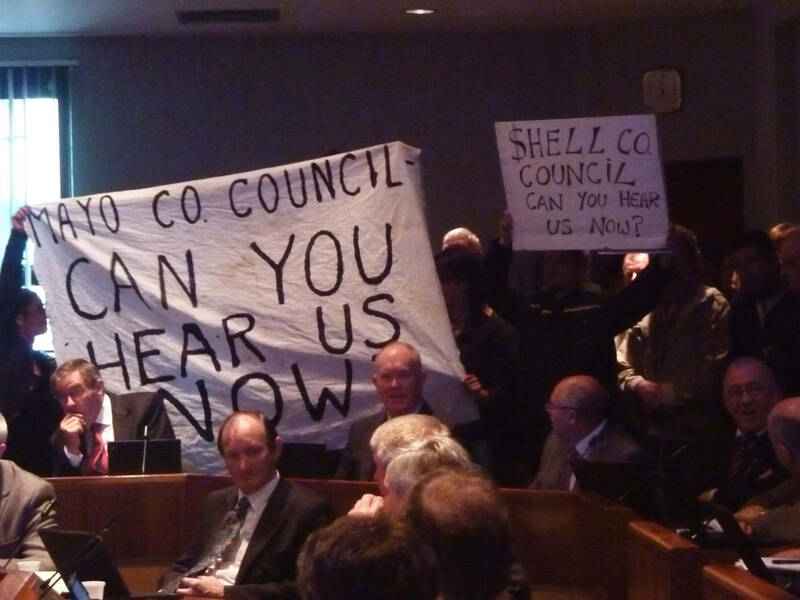 Shell Co. Council can you hear us now? Today the AGM of Mayo Co. council was disrupted by a high pitched grinding noise; a recording of the sounds that came from Shell's compound in Aghoose during the June bank holiday weekend. Local residents aimed to demonstrate how they were ignored when they tried to complain about this disturbance which lasted for four days, and were told the council offices were closed on the bank holiday. [Shell to Sea] This relates to the judical review case that An Taisce settled with the State, where one of the points had been that Shell hadn't submitted a correct Environmental Impact Assessment (EIA). It is interesting to note that the Senior Counsel that An Taisce used in settling the Judicial Review, Colm Mac Eochaidh, has recently been appointed a High Court Judge, after just 3 years as a senior counsel. [Shell to Sea] Shell and Statoil are currently carrying out Seismic surveys off the Mayo coast. In this video Norwegian fisherman Bjørnar Nicolaisen warns of the consequences that "seismic shootings" has had on marine life and the fishing industry when it was carried out in Norway. Fishing catches reduced by 60% in the year after the seismic surveys started and still hasn't returned to normal levels.